The ExpressSAS H12F0 leverages two next-generation storage technologies - PCIe 3.0 host interconnect and a 12Gb/s SAS/SATA interface to storage. Featuring 16-external ports using the latest miniSAS HD connector, the H12F0 is designed with the enterprise customer in mind. With extensive testing and qualifications, it performs flawlessly in transactional environments such as banking, finance, business intelligence, cloud computing and database applications. ATTO 12Gb SAS HBAs double the performance over previous generations of SAS/SATA cards and offer fresh new features that reduce downtime, improve efficiency and save money on the bottom line. They provide more flexibility for connecting storage, greatly decrease latency to SATA drives, make it easier to manage the overall storage infrastructure and improve connection diagnostic capabilities - all at a lower total cost of ownership. Additionally, ExpressSAS HBAs provide the highest and smoothest throughput for streaming applications such as tape backup and archiving, video post-production, geologic survey and video-on-demand applications. ATTO Technology, Inc., ExpressSAS 12Gb/s SAS host bust adapters (HBAs) provide high-performance data protection to direct-attached SAS and SATA storage. With a wide variety of port configurations and built-in Power Center Pro RAID 0, 1, 1e and 10 for performance and protection, these adapters offer flexibility for every range of application. For 30 years, ATTO has been at the forefront of the latest innovations in storage connectivity. The ExpressSAS 12Gb/s SAS HBAs are available with a wide selection of 8, 12, and 16 port options to support a dense and efficient connection to storage from rack-mounted servers and workstations in datacenter, data warehousing, video on demand and other high-availability, high-performance applications. 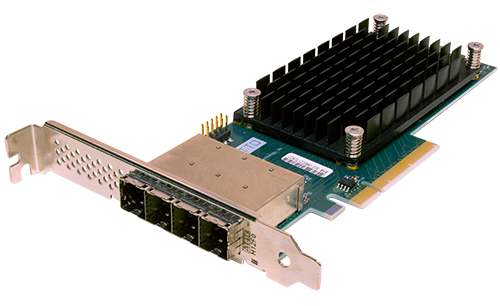 ExpressSAS 12Gb/s HBAs combine 12Gb/s SAS speeds and x8 PCI Express 3.0 with powerful hardware and software elements to manage latency in real-time environments. Additionally, the H1208 and H120F HBAs include Power Center Pro, an integrated software RAID solution that brings the performance and protection of RAID to attached storage devices. Exclusive Advanced Data Streaming (ADS) Technology maximizes CPU processes to deliver smooth and reliable data transfers and the hightest consistent performance. 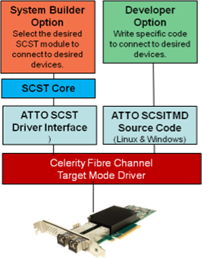 ATTO pays close attention to detail in board design and signal integrity to minimize transmission errors and data corruption. These differentiating capabilities make ATTO the premier choice for high-performance direct-attached SAS/SATA storage connectivity. 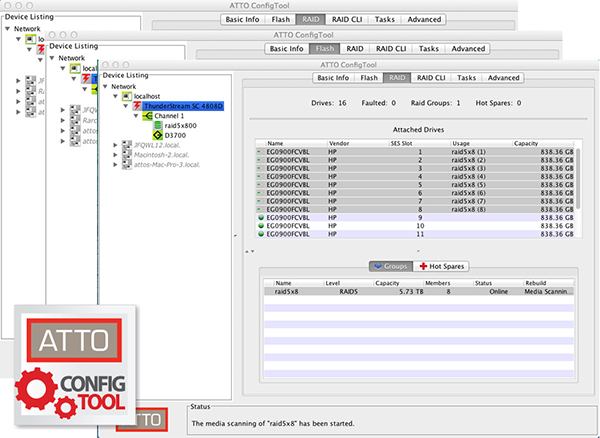 ATTO offers a board array of management and diagnostic capabilities. Cables, the most significant point of failure, are often difficult to troubleshoot. 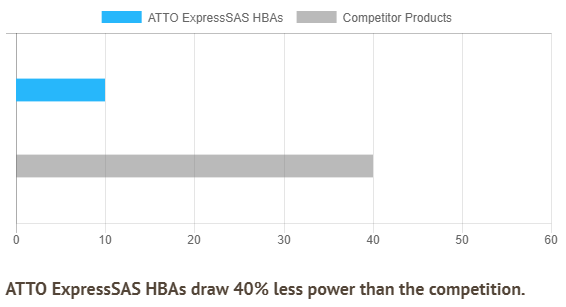 ExpressSAS 12Gb/s SAS HBAs are able to help isolate cable and connector failures (and intermittent problems) through independent control of each port, as well as discovery and cable management of data passed through the mini-SAS HD connectors. The ExpressSAS 12Gb/s SAS/SATA family of host bust adapters offers the fastest available connection to direct-attached SAS or SATA storage. The impressive speed of the 12Gb/s SAS interface, coupled with a x8 PCI Express 3.0 host interface, delivers a dense and efficient connection to all types of storage - from rack-mounted servers and workstations in data center, data warehousing, VOD and other high-availability, high-performance applications. Advanced Data Streaming (ADS) latency-management technology controls the acceleration of data transfers to move large amounts of data faster and more efficiently. Dimensions Length 6.600", Height 2.713"